Liebling selected from 14 million images at the Library of Congress! Exhibit opens on April 20th in Los Angeles. On Easter Sunday in New York City, Jerome Liebling encountered a young boy on the street outside church, dressed in his Sunday best: broken shoe-laces, tattered trousers, a threadbare tweed coat and cap. Hands buried in his pockets, the child spread his coat open wide, and a click of Liebling’s rolleiflex shutter transformed him into Butterfly Boy — a winged superhero who could soar away from his impoverished world. Steven Kasher Gallery is proud to announce Jerome Liebling: Brooklyn and Other Boroughs, 1946 – 1996. This is the second exhibition of Liebling’s work at Steven Kasher Gallery. The show features 50 black and white and color photographs taken in Brooklyn, Manhattan, and the Bronx over a five decade span. The exhibition highlights Liebling’s roots in, love for, and inspired representations of his home city. Jerome Liebling (1924-2011) was born in Harlem and grew up poor in Bensonhurst, Brooklyn. In 1942, Liebling quit his first semester at Brooklyn College to enlist in World War II, serving in the notoriously deadly glider infantry. The carnage he witnessed fueled his creative impulse to “figure out where the pain was…” Liebling returned to Brooklyn College in 1946 to study art under the G.I. Bill. Ad Reinhardt’s Bauhaus-influenced design classes honed his formal sensibility; documentary photographer Walter Rosenblum opened his eyes to the power of the photographic image. In 1947, Liebling joined the Photo League, a socially minded collective of photographers who fanned across New York to document hidden corners of the city. For Liebling, children surviving the rough-and-tumble city streets became a symbol of fortitude. “Their faces could inform all that they felt, from grace, to reflective questioning, to supreme prescience,” he said. “Sometimes there was a hint of defeat, but more often there was improvisation and brilliance.” One Easter morning in Harlem, Liebling encountered a young child dressed in his Sunday best: broken shoe-laces, tattered trousers, a threadbare tweed coat and cap. Hands buried in his pockets, the boy spread his coat open wide, and the click of Liebling’s shutter transformed him into Butterfly Boy. This image of a winged superhero who could soar away from his impoverished world has become a beloved icon, appearing on public posters and billboards in New York, Paris, Amsterdam, Japan and elsewhere. In 1949 Liebling accepted a position teaching photography and filmmaking at the University of Minnesota. Twenty years later, he returned to New York to discover that the city of his childhood had vanished. ”I came back, and it was a disaster,” he said. Liebling’s 1970s photographs of the crumbling South Bronx depict a bleak realization: the Butterfly Boy may not have escaped to a better place after all. The young man in the picture Charlotte Street is trapped amidst ruins, in devastation as harrowing as Liebling’s wartime experiences. Despite their imagery of senseless destruction, his photographs reveal the ever renewing spirit of humanity pushing up through the cracks. In the late 1970s, Liebling rediscovered the long-lost Brooklyn of his childhood in the oceanside neighborhood known as “Little Odessa” in Brighton Beach. He spent three decades photographing there in brilliant chromogenic color as the old wave of Jewish denizens gave way to the new wave of Russian immigrants. The Frédéric Moisan Gallery is pleased to announce its representation in France of the estate of the photographer Jerome LIEBLING with the exhibit “Radiance Visible” at the 2014 Photography Month Festival in Paris. The show will include a selection of 30 prints from the 1940s through the 1990s. 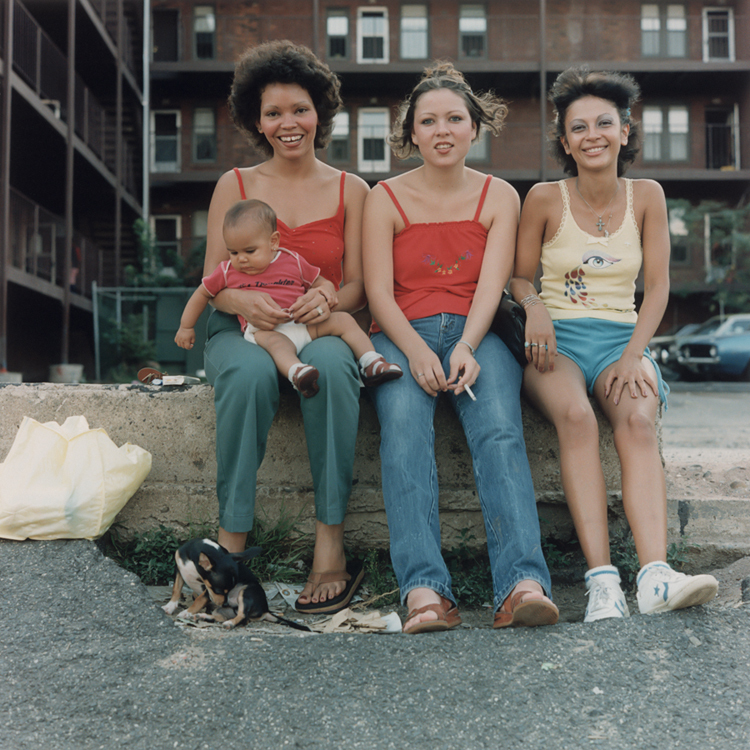 Jerome Liebling’s work – in black and white or color, on city streets or in rural towns ­– defies easy categorization. His images are suffused with startling intimacy; the gaze of his subjects reflecting struggles yet to be overcome. The places, too, bear the traces of time and the scars of victory. And yet the weariness of those faces and places does little to diminish their power. Liebling’s work is a tribute to human perseverance and courage. Jerome Liebling (1924-2011) is a photographic master whose work spans six decades, from the 1940s to the present. In 1948, he joined the “Photo League,” a cooperative of socially concerned photographers that included Paul Strand, who became his mentor, as well as W. Eugene Smith and Aaron Siskind. Armed with his lens, Liebling took to the streets to capture visions of urban life yet to be shown. “My sympathies have always been with everyday people. They are the center of my photography,” said Liebling, who revealed the unique value of each individual. Liebling’s body of work defies easy categorization. He was in his element in both color and black and white; at home on New York City streets or in Massachusetts apple orchards. In his last years, Liebling used digital printing with the deftness and refinement of a master to create new interpretations of his most iconic images. “Liebling’s large-scale photographs are revelatory,” wrote Boston Globe critic Mark Feeney. “Monumental but not overbearing, these pictures are hard to imagine as having been any other size.” Many have never been exhibited until now. Jerome Liebling grew up in Brooklyn, a first-generation son of European immigrants. During World War II, Liebling served in the 82nd Airborne. He enlisted to fight for a cause he believed in but returned from military service with a staunch anti-war sentiment that endured his entire lifetime. Back home, he enrolled at Brooklyn College under the G.I. Bill and studied design with the painter Ad Reinhardt and photography with Walter Rosenblum. In 1948, Liebling joined the Photo League, a socially minded photographers’ cooperative, where, along with Paul Strand, W. Eugene Smith and Aaron Siskind, he took to the streets to focus his lens on undocumented corners of urban life. At Hampshire College, where he taught from 1969 to 1989, Liebling’s educational philosophy had a powerful impact on generations of photographers and filmmakers. The story of his influences was the subject of a New York Times feature by Randy Kennedy in 2006. Jerome Liebling’s photographs are held in the permanent collections of the Museum of Modern Art, New York; the Metropolitan Museum of Art, New York; the Smithsonian American Art Museum, Washington; and the J. Paul Getty Museum, Los Angeles, among many others. Please join the Holyoke Public Library and the City of Holyoke for the opening of this never-before-seen collection of classic images from one of our nation’s great photographers. Your presence at the historic opening night benefit gala will support the completion of a new 21st Century Library and Learning Facility for the people of Holyoke and the region. Each premium benefit gala ticket holder will receive a limited-edition (limited to attendants and supporters of this event) embossed and stamped original poster of Young Women and Baby (above). Estimated value is more than the price of admission. To purchase premium tickets please click here or call 413-322-5636. General admission tickets will be available at a reduced price starting March 18th, subject to availability. The Holyoke Cultural Council, Smith College Museum of Art, El Sol Latino and United Bank. “A Walk Through Holyoke” is part of Holyoke: Points of View, Art and Cultural Events to Benefit the Holyoke Public Library, April, 2013. Copyright © 2013 Holyoke Public Library, All rights reserved. Sunday, June 10, 2012, at 1 p.m.
Hampshire College invites the public to a tribute exhibition of Jerome Liebling photographs. Twenty-seven monumental images—many are over three feet wide—are on display in the Jerome Liebling Center for Film, Photography, and Video on campus through November 8. The photographs are from the last exhibition Liebling curated of his own work, a summer 2010 show, “Capturing the Human Spirit,” at the Currier Museum of Art in Manchester, N.H. Renowned photographer Liebling teamed up with master printer Jonathan Singer of Boston, using digital printing techniques to create these exceptional images from black-and-white and color-film negatives dating from 1947 to 1996. Details and definition are revealed in the monumental photographs that were hidden in prints one quarter their size. On Sunday, October 30, the life and work of Jerome Liebling will be celebrated at a public memorial service at 1 p.m. in Hampshire’s Robert Crown Center. A reception will follow in the Liebling Center. Liebling, who passed away July 27 at age 87, was among the founding professors of Hampshire College. He joined the faculty in 1969, before the College opened in fall 1970, and taught at Hampshire until his retirement in 1990. His name graces the Jerome Liebling Center for Film, Photography, and Video—a centerpiece of the Hampshire College campus—because he was as gifted and influential as a teacher and mentor as he was as a photographer and filmmaker. Jerome Liebling, 87, internationally renowned photographer, filmmaker and teacher, died of cancer Wednesday, July 27th at Cooley Dickinson Hospital in Northampton, MA. He inspired generations of students with his humanitarian vision expressed through the media of photography and film. He received many honors and awards including two Guggenheim Fellowships, and his work is in the permanent collections of many prominent museums including the Museum of Modern of Art, the Boston Museum of Fine Arts, and the J. Paul Getty Museum in LA. In recent years Liebling has had exhibitions of his work at The Yale University Art Gallery, The Smith College Museum of Art and The Currier Museum of Art. He published numerous books of his work including The Dickinsons of Amherst, The People, Yes, and Jerome Liebling Photographs. Born in New York City on April 16th 1924, Liebling was the son of Morris and Sarah (Goodman) Liebling. He was raised in Brooklyn the youngest of three boys. His brothers David and Stanley pre-deceased him. Liebling enlisted in the U.S. Army during WWII, served in the 82nd Airborne Division and saw combat in Europe and North Africa. As a result of his military experiences, Liebling became staunchly anti-war. After WWII, under the GI Bill, Liebling studied photography with Walter Rosenblum at Brooklyn College and filmmaking at the New School for Social Research. In the late 1940s he was a member of the Photo League in New York City where he worked with the some of the most noted documentary photographers of the era. The Photo League was a cooperative of photographers with common artistic and social sensibilities. Throughout his life Liebling had a deep concern for social justice and human rights. In 1949, Liebling established the film and photography program at the University of Minnesota. The same year, he married Phyllis Levine of Brooklyn, NY. They later divorced. In Minnesota he collaborated on several award winning documentary films with colleague Allen Downs. In 1969, Liebling founded the Film and Photography program of then new Hampshire College in Amherst, MA. He taught there for 20 years, inspiring a new generation of photographers and filmmakers. Liebling is survived by his wife, Rebecca Nordstrom, and children: Madeline Liebling of Shelburne Falls, MA, Tina Liebling (Mark Liebow) of Rochester, MN, Adam Liebling of Cambridge, MA, Daniella Liebling (James Lane) of Brooklyn, NY, Rachel Jane Liebling of Brooklyn, NY, and grandchildren: Gabriel Liebling Vigh, David Liebow, Hannah Liebow, Samuel Liebow, and Nathaniel Xavier Liebling. A memorial service will be held in the fall.